New! What is a Watershed? Captivate your students with a visit from Tort, our oldest (63 years) and largest resident. This yellow-footed tortoise comes from the Amazon. A Science Center staffer will bring the animal, describe how we keep her healthy and safe, and answer student questions. How do wild animals survive a Massachusetts winter? Students explore three different animal adaptations - hibernation, migration, and staying active. We spend most of the program outdoors looking for evidence of animal behavior. This includes searching for tracks, nests, and live animals. Students are guaranteed to find something - prior to the exploration, the Science Center places animal artifacts where students will find them. What do different animals eat? Using pictures of teeth and claws students will predict if an animal is an herbivore or a carnivore. Then we observe a live omnivore (Shrek, our hedgehog). Teachers are encouraged to read Jan Brett's The Mitten prior to the program. This program works best in fall and spring when trees have leaves. We focus on acorns and oak trees as part of the life cycle unit. We'll start off with a play that allows all students to act out the life cycle of an oak tree. From there, we observe oak trees in various life cycle stages. We will use Eastman's outdoor classroom to open up acorns and observe the root and stem. What happens to a leaf once it falls from a tree? What happens to food we don't eat? What exactly is a vermicomposter? Working in small groups, students follow a "recipe" to create their own vermicomposter. They make predictions about what will happen over time, then make obserations to see if their predictions came true. This trip works best if the classroom teacher can find at least 3 adult helpers to accompany us. Learn how to "read a forest" by looking for evidence such as felled trees, bird nests, and rotten logs. Working in teams, we'll go on a forest scavenger hunt to learn more about reading the forest. Figure out creative ways to measure the girth of trees, and use a tool called "slice of silence" to help focus your observation skills. Enrich your fossil unit with this full day of activities at the Science Center. Students enjoy a bag lunch and use the Newman playground at recess. If a full day doesn't fit your schedule, we can also plan to do the fossil activities on separate days, either in your classroom or at the Science Center. What is it like to be a paleontologist out on a dig? Students find out by working in cooperative teams, using tools, and digging for replicas of dinosaur bones. Students document their find through their own sketches. Students sketch and observe live animals. They examine bird and reptile artifacts in order to compare and contrast the two groups. Evidence of an ancient volcano! Students examine volcanic tuff at Claxton field in Needham. As part of the Changing Earth Unit, students visit natural formations and try to figure out what types of events created the structures they will observe. We'll start off in Wellesley where we will find a Volcanic plug (remains of an actual volcano). Next, we make several stops in Needham: The Eliot School rock (created by a river), Claxton Field (volcanic evidence), Rosemary Lake (created by a glacier). Students observe the night sky inside an inflatable dome. The class predicts and observes changes in the sky such as sunrise and sunset, moon rise, movement of the stars and constellations. 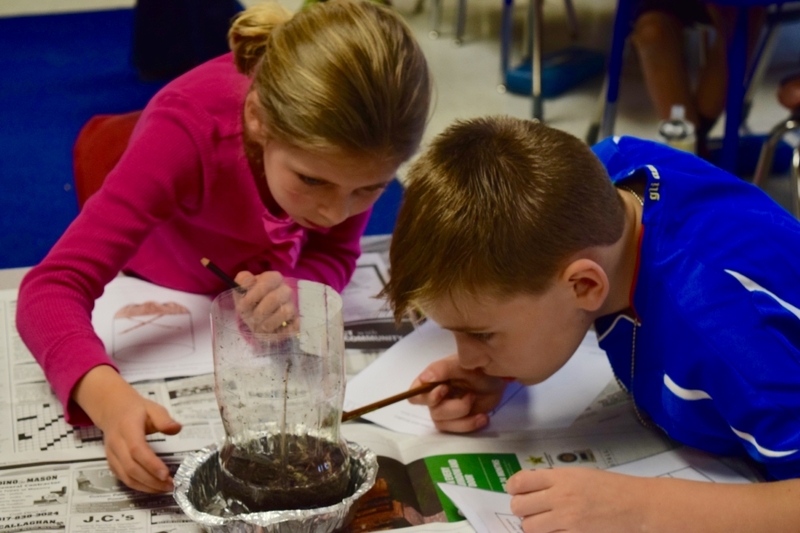 As part of the Changing Earth Unit, students explore the creation of rivers and streams by using models called Stream Tables. Working in small groups, students first observe how a river forms. Once the river has established its path, students build a town and try to protect it from flooding. As part of the Insects Unit, students use microscopes to examine parts of a honey bee and figure out how these parts help determine a honey bee's behavior and survival. 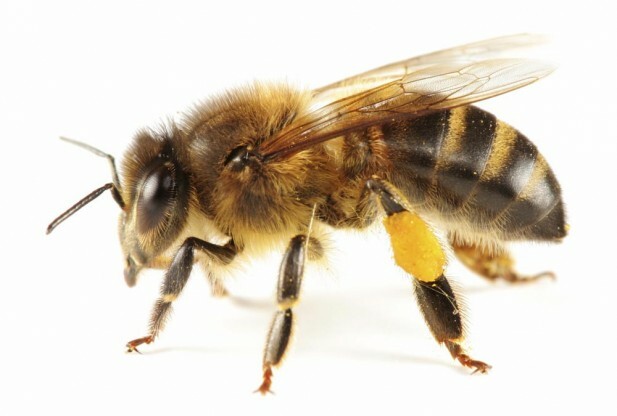 Even within the same hive, honey bees have different jobs such as the queen, drones, and worker bees. Students also discuss how honey bees help plants, other animals, and humans survive. Invertebrates - The Marvelous Majority! This two-part learning experience for students is an integral component of the grade five, life science curriculum. Teachers have an option of bringing students on an all day field trip to the Science Center to experience parts 1 & 2 together on the same day. for microscopic creatures at the pond, and vertebrates and invertebrates in the woods. In the Science Center Discovery Room, a Science Center staffer guides the students in discovering the diversity of living organisms within a drop of pond water. Students use magnification tools, classification keys to reveal and identify the microscopic invertebrates of the Eastman pond.Students will also observe any larger organisms collected in the woods. This class introduces students to the importance of dissection and the use of basic dissection tools. Because this class is likely a student's first experience with dissection, we work slowly to allow students time to gain a better comfort level with the process. Students quickly overcome any misgivings as they delve into the fascinating innards of a squid. Demonstration that shows a variety of large scale simple machines and how they work.